Early this morning, an eight-car commuter train derailed in Chicago, crashing into an airport platform and injuring at least 32 passengers. It seems like a miracle that no one was killed, given the damage sustained at the station. CTA spokesman Brian Steele told reporters that the train appeared to going faster than normal when entering the station. "We will be looking at everything — equipment, signals, the human factor," Steele said. Steele said that the train operator was in the westernmost car on the train, the car that ended up off the tracks on the escalator. The other seven cars remain on the track, Steele said, and officials believe they could be moved. Dealing with the car on the escalator, however, will be more difficult, Steele said, and officials are still debating what to do. One option, he said, would be cutting the car up and removing it piece-by-piece. Steele estimated that it could be 12 to 24 hours to clean up the mess. 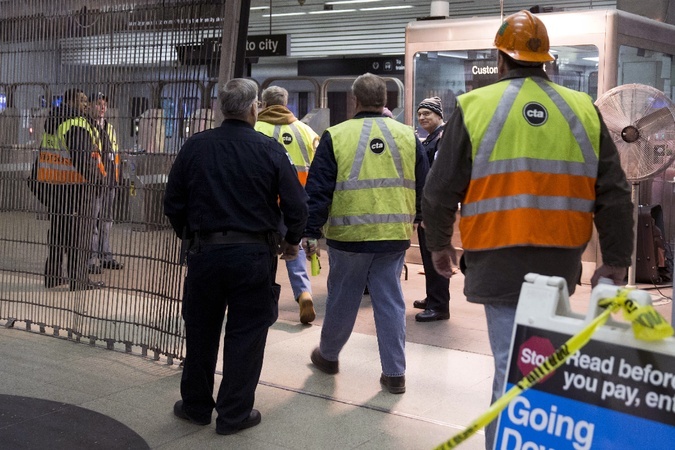 Officials said the station will likely remain closed for 12-24 hours.